A big part of the fun of doing The Camp of Champions is progressing what a summer camp should be. The other fun part of COC is sharing the magic of Whistler with the world. To make both of those things a reality we are launching the COC iPhone App. Check news feeds, photos and videos all from your iPhone. The app was built by Adam Sullovey, one of our super talented friends, who makes ones and zeros into magic. It's been about 8 months in the making and after more than a few &quot;Hey, wouldn't it be cool if it did this&quot; changes and a couple or three &quot;Hey, you need to change this&quot; from Apple to get the final approval for the app, the app has finally launched today in the Apple App Store. 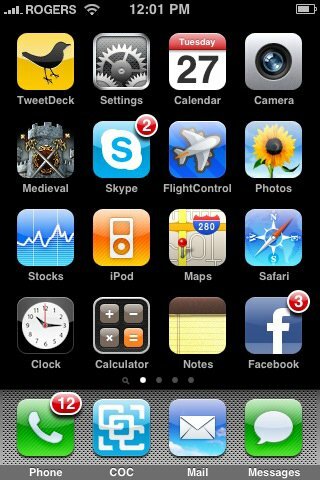 The app is free and you can use it to keep up with news feeds from Newschoolers.com, WhistlerBlackcomb.com as well as the Camp of Champions. There are sections on the app where you can check out all the COC videos and photos. The app will update every time we add new content. As we add new photos and videos every day when camp is on, it will be a great way to keep your riding stoke when you are wishing you were in Whistler instead of sitting on the bus. It will also keep you stoked on the cross country drive or plane ride to camp. A big part of the Camp Of Champion App uses the GPS feature of the iPhone in a map feature that has everywhere you need to know about in Whistler loaded and locked down. When you come to camp and want to know where to meet us at &quot;The Dorm&quot; where to go to eat, where's the skatepark, or see the top of A-Line on a map, you can just click on the &quot;Maps&quot; feature. We will be adding more spots as we get closer to camp. 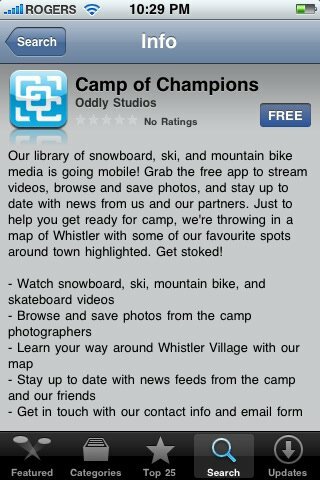 To find the Camp Of Champion App in the iPhone App Store, type &ldquo;Camp of Champions&rdquo; into the search field. Download it and Get Stoked.